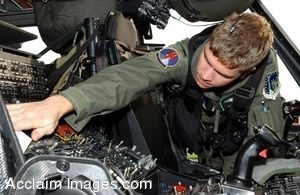 Description: Clip art photograph of U.S. Air Force 1st Lt. Vincent Powell, a helicopter pilot with 56th Rescue Squadron, conducts preflight checks on an HH-60 G Pave Hawk helicopter on Royal Air Force Base Lakenheath, United Kingdom, Oct. 18, 2006. (U.S. Air Force photo by Airman John Easterling). Clipart photograph by Department of Defense Public Domain.